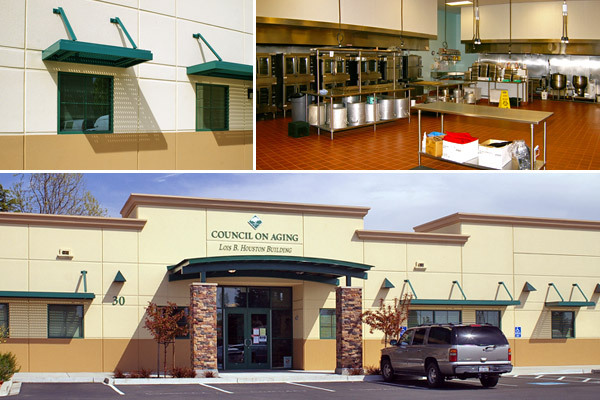 This facility consists of a 7,028 square foot office building and a 10,310 square foot food distribution building. The project also includes a large emergency generator to allow the facility to provide services for local government agencies in times of emergency or natural disaster. The office building houses administrative functions, including a large conference room to accommodate training and public assembly events. The food distribution building was designed to facilitate the production of over 3,000 meals per day. This building includes office space, a loading dock, multiple freezer and cooler rooms, food prep and dishwashing areas, and a large production kitchen. Sustainable and energy efficient design features include skylights to minimize artificial lighting, use of pre-cast concrete wall panels and open web steel roof joists, and low water usage landscape and irrigation.